The Question of Alpaca Origins. By Jane C. Wheeler, Ph.D.
been a real debate on the matter, just the accumulation of divergent scientific opinions over a very long time concerning the evolutionary history of the South American camelids. similarities. The foremost researcher of the day, Carolus Linnaeus, published numerous editions of his work Systema Naturae, a massive catalogue describing and classifying all plants and animals then known to European science. respectively. The species, or group of animals with the greatest number of shared physical traits, is the basic unit of classification in the taxonomic hierarchy. In turn, species are grouped into genera (genus = singular), genera into families, families into orders and orders into kingdoms, all on the basis of declining frequency of shared traits. the genus Canis, family Canidae, order Carnivora and kingdom Mammalia. During the 1700s information about non-European plants and animals was often lacking, incomplete or distorted. 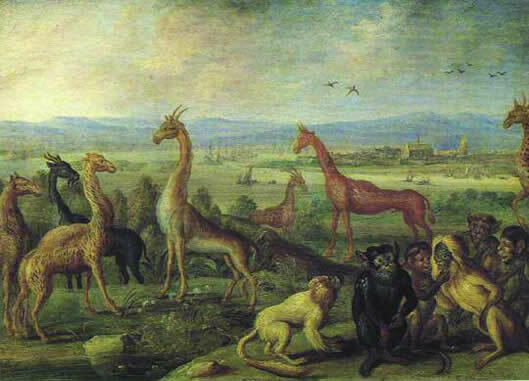 and Camelus in his compendium of plant and animal species. 1700s fitted the evolutionary relationships depicted on those trees. individual, population and species levels. about scientific names and the implied evolutionary relationships in many species. imply that alpaca, llama and guanaco form a single group within which the guanaco would be the ancestral form, while the vicuña is a separate never domesticated wild species. alpaca is a product of hybridization between llama and vicuña. Peruvian highlands indicated a vicuña to alpaca domestication 6-7,000 years ago. Analysis of hemoglobin and amino acid sequences from zoo animals in Germany (1980-90s) and Chile (1960) produced evidence both for and against vicuña domestication, while immunological and protein-sequencing data from studies in the United Sates (1980-90s) was inconclusive. Faced with such contradictory evidence concerning alpaca origins, resolution of the debate appeared impossible until the mid 1980s when advances in DNA technology accelerated analytical capability to the point that the study of DNA became routine and genome mapping possible. parentage testing for studbook registries. while I was at the Macaulay Land Use Research Institute in Edinburgh. headed a team of U.K. and Peruvian researchers working on many aspects of South American camelid genetics and in 2001 they published an article in the Proceedings of the Royal Society London B (268(1485):2575- 2584), which finally resolved the question of alpaca origins. however, molecular genetics has made it possible to identify the hybrids and the question of alpaca origins is no longer a matter of debate. postdoctoral studies at the University of Paris. For more than 30 years she has conducted broad based research on the South American camelids, covering topics from origin, evolution and domestication of alpacas and llamas, to molecular genetics, breeding and fibre production, as well as vicuña and guanaco genetics and conservation.